Today 7 out of 10 Americans are likely out celebrating the holiday of St. Patricks Day, now while the day has different meanings to different people it usually gets associated with people drinking to the point of collapse (but not in all cases). Enjoying libations in a responsible way and hanging out with leprechauns sounds like an ideal time. Several different songs came to mind when I was piecing things together ranging from George Thorogood to Dropkick Murphy’s but my mind steered me towards something different and it happened to be a pretty popular tune in the 90’s so I decided to hitch my wagons to it. Many a karoake machine is probably filled with this song which makes it that much better of a choice. It’s probably certain that you’ve sung it at some point in your life. This is the third post I’ve done with coverage for Skin Fair, along with featuring the CATWA “Skell” mesh head that is an exclusive to the event I am also wearing an exclusive skin named “Dash” by Go&See. I really like how to two pair together, I think that I kind of have that Irish look about me that I was going for when I started putting the look together; if I wasn’t featuring a new hair I probably would have accessorized with a flatcap for added style. “Dash” as I said is an exclusive and comes in Goth, Pale, Summer, Tan and Dark Tan with head appliers for both CATWA products and Omega enabled mesh heads as well. This may not have been mentioned in the previous blog I featured the “Danny” skin in but Go&See has also released newer body appliers to go along with these skins and can be purchased at Skin Fair as well as in store. I am also going to make an amendment to what I wrote in about the “Danny” shape in the previous post as well. It is sold separately as is the shape for “Dash” but you will be able to grab them up at the Fair while you are there. This time I wore my own personal shape but I feel it doesn’t alter the face or skin at all and you can also see what it looks like with my Nivaro “Rugged” beard that seems to be becoming a regular addition to my look. The Men’s Deparment is about halfway through the March round and I’m showing off this really cool hair named “Matt”. It’s a nice little short side swept hair that you can wear a shaved hairbase to give it a closely cropped look or just wear a normal one to make it look natural and not shaved. This is the first time I’m actually wearing a shade from the “Reds” color pack. Of course you have the option to purchase the 5 color packs (Blonds, Browns, Monochromes, Reds and Vibrants) or get all of them together in a FATPACK which saves you some dough. I’ve talked about the color HUDs have a color picker so that you can actually change your hair to a shade that isn’t in any of the packs which really gives you more than 25 options. Lots of choice and a great quality product as I’ve come to experience from Modulus. 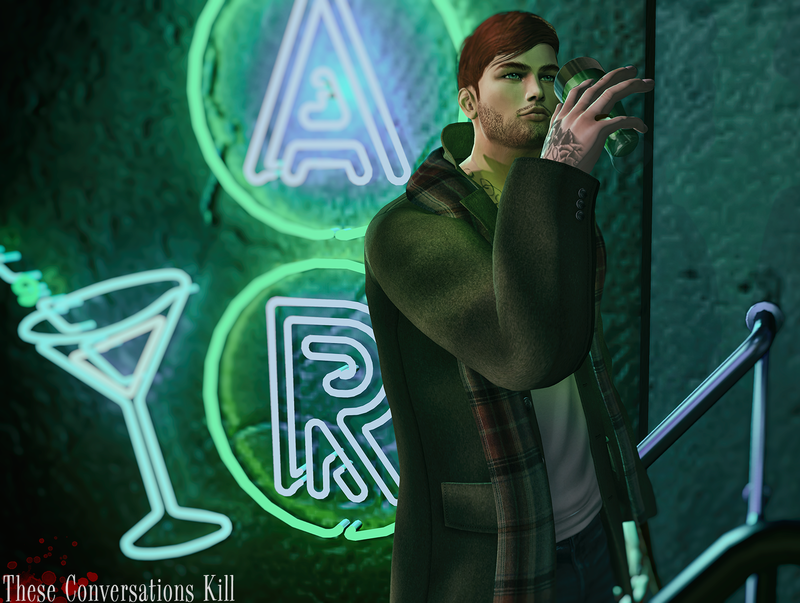 Spring has not yet set in yet in most places so I thought it would work out well for me to use the “Chesterfield Coat” by ::K:: to keep my avatar comfortable as he heads out the door as the bar starts closing up. I really like longer coats and the add-on scarf is a great touch which you can change the color/pattern of with it’s included HUD. It fits great and and it’s one of those things that I never have to worry about when I see something that’s been made by Kitt Ragu. The Chesterfield Coat fits anyone with a Belleza, Signature (Gianni) or SLink mesh body. Take a cab from the credits below to give it a closer look! What is a St. Patrick’s Day photo without a bar setting? This super backdrop is from Paparazzi, who I have featured on more than one occasion and for a very good reason. The quality of the work in the mesh and textures help any photographer/blogger get the results they are looking for and it’s not going to zap their wallets (or purses for the gals). A week ago for Fifty Linden Friday I went to Commoner and picked up this “Pint of Pilsner” which comes in the green version I’m using and also an amber version. I purchased them both knowing that at some point I’d be able to use them for something and it must have been foresight that I picked up the green one because it occurred to me while I was setting up that I had this and made sure I included it into the shot. I also have to give a shout out to WRONG & The Owl for another cool pose collaboration. I remember the #10 pose set being at Men Only Monthly for the Dec/Jan round and wasn’t sure what I might need it for but the ad for it depicts a wine flute but alcohol is alcohol so I switched it out for some beer without any issues. That just about wraps up another blog entry for me but keep your eyes peeled for my final coverage of Skin Fair and some of the other events that are starting up or have started up recently (Kustom9 and Men Only Monthly among others). Have a safe evening and rest of the week and and maybe I’ll see you out and about!